The weather was changing again. Trees, once green and filled with life, were now an array of colours, ranging from deep reds and oranges to a dead brown that crunched and disintegrated from the slightest touch. But it wasn’t the colours that he feared, nor was it the dying leaves and plant life, it was the cold that worsened with every passing night and the fear of starvation that quickly followed. As the critters foraged for food, so did he. Years ago, before his father died from infection, he was taught how to survive through the winter months—how to find and store food, what could be eaten and what could be used to keep warm. That was long ago, though. Since then he had travelled south to where the winter months weren’t as severe, just like his father had made him promise. Throughout the journey, it hadn’t been easy to avoid The Devil’s Creatures, as their influence bordered every forest and lake and pond. He had seen acres of trees torn from the earth and replaced by massive structures that his father called swarms. They were places where The Devil’s Creatures gathered to take from the earth and not give back. These structures scared him. Not because of their destruction, but because they interested him. They were tall and remained colourful throughout the year and had bright, warm-looking lights that shone throughout the night. If his father knew how much he enjoyed these swarms, he’d be beaten senseless until the mere thought of such a thing would cause his flesh to burn from the memory of the freshly plucked twig against his backside. In recent days, however, he had become fascinated with a smaller swarm. It wasn’t like any other he had seen before. It was the colour of the sky as the sun fell behind the trees and its top was pointed with a strange stump on it that blew out smoke throughout the night. On its sides it had holes that allowed him to see inside and he often watched The Devil’s Creatures from the safety of the trees. They always looked so warm and happy, which was something he longed for more than anything. Sometimes he would fantasize about joining them in their swarm, and he’d be able to eat and be warm and happy, just like them. But then the guilt would consume him and his father’s words would echo throughout his head, beating down on his thoughts just as hard as the rod would have done. The boy rubbed at his wrist, over the last scar his father had given him, and remembered his promise. He knew that The Devil’s Creatures wouldn’t be kind to him, that they’d beat him and feed him to the dogs. The fantasy remained, though. He couldn’t shake it, no matter how hard he tried. And as the sun vanished behind the forest, the boy turned back to the trees and disappeared in the thinning foliage. Dennis rolled his eyes as he rummaged through his top drawer, in search for a matching sock. “Yeah, okay, Dad!” he yelled back. “Just a minute!” But he wasn’t really in a rush. Football wasn’t his sport, or, more accurately, sport wasn’t his sport. But it was important to his father, so he always made an effort to toss The Old Pig Skin around with his dad out back each and every Thanksgiving. By the time he arrived downstairs, his father was already gripping the handle to the back door in anticipation. Playing football before the game began was a Hayes Family tradition that started more than three generations ago, one that Dennis knew he’d have to continue with his children, as would his children’s children, and so on and so forth. To Dennis, though, it seemed more like a family curse. “What took you so long?” asked Dennis’s baby brother, Keegan, who was sprawled-out on the sofa watching the pre-game nonsense on the television. “Couldn’t find a matching sock,” replied Dennis as he zipped up his hooded sweater. “Okay, let’s go!” he shouted as enthusiastically as he could bear and slapped at his brother’s shoe. The ball was tossed the moment they were on the leaf-coated lawn and Keegan dove for it, catching the ball in midair and gripping it to his belly, as his back hit the ground and he barrel-rolled once before springing back up to his feet. “Show off!” Dennis teased and he held out his hands for Keegan to pass the ball. “Nuh-huh.” Dennis caught the ball, feeling the leather grind against his already-cold palms, which reminded him just how much he hated the game. “Dad, go long!” he swallowed the pain and adjusted his grip to the threads, imagining that he was about to throw the perfect spiral… until the ball left his hands. It wobbled through the air like a drunken goose and crashed against the ground, ten feet short of his father, before rolling back and forth and side to side as if to taunt him further and rob him of every last shred of dignity. A Hayes Boy has to be good at football. The school’s counting on it. Unfortunately, some traditions are harder to keep than others. From the protection of the trees, the boy watched The Devil’s Creatures as they threw a large, odd-looking egg at each other and laughed whenever it hit the ground. Although he knew he should be angry at the creatures for being so cruel to an unborn animal, and for being wasteful over a potential meal, he couldn’t help himself but to watch in envy. It wasn’t just envy he was feeling, though. They spoke a similar tongue to his father and he found their voices comforting, despite the fact that he couldn’t make out most of what they were saying. It did make him wonder, though. If The Devil’s Creatures were so evil, why would God permit them to speak the same language as his followers? Just then the large egg bounced off the ground and disappeared in the bushes behind him, and one of The Devil’s Creatures was running toward him. The boy panicked. His father hadn’t trained him for a situation like this, so he had to improvise. He turned and ran for the egg, trying his best to bury the excitement he was feeling for finally being able to touch it. For the briefest of moments, as he stared down at the egg, he let his mind lose itself in fantasy, and he imagined that he threw the egg back and was then invited to participate and stay with them. It was that thought that ruined everything. Without stopping to think, the boy reached down and picked it up, examined its strange texture and fell in awe over how light it was. But that’s when it happened. He turned around, drew back his arm, the egg clutched tight in his hand, just like he had seen The Devil’s Creatures do, and chucked it back through the trees with all his might. The split second that Dennis stepped past the first tree, the ball sped through the air, only inches away from his head, and zipped across the yard, like a soaring dart, right into his father’s hands. “We’re not going to hurt you!” Keegan joined in next to his dad. Dennis turned back around, following suit, and started searching for the person with the iron arm. The zipping-whoosh sound that the ball made as it launched past his ear still itched at his drum, and he wasn’t too sure he wanted to meet someone that could throw like that. But still, he followed his dad and brother into the woods, calling out and offering help that he wasn’t sure he wanted to give. The further out the three got into the woods, the farther apart they became. Their bellows would chime from one person to the next like a delayed broadcast being repeated again and again. Just as Dennis was attempting to think of an excuse to go back inside, he heard a sudden rustling in the leaves ahead. Dennis froze as his imagination stirred and began to play tricks on him. Visions of twenty-foot bears and mutated cougars caused his heart to pound like a drummer boy on speed as he tried to force his feet to turn back around and run toward the house, but nothing happened. If he did run, he’d never hear the end of it from Keegan, but if he stayed, more than likely, he’d be swallowed whole by the savage beast. The rustling stopped, freaking Dennis out even more, and he started to step back. But just as he did, his eye caught a glimpse of something—maybe someone—until his heel lost a fight with an unseen, fallen branch. The very moment he began to fall back, the entity he had seen in the leaves threw itself out of the bushes and into the air, and Dennis knew that he was done for. Instead of a roaring cougar, something else had landed over him… a boy. Or at least it was the size of a boy. It had landed on him, growling like an animal—and just as fiercely—so close to his face that Dennis could taste the foulness of his breath. The creature’s head snapped to the right as the sound of fast-approaching footsteps rustled through the leaves and it retreated back in the leaves. The leaves suddenly rustled and something darted straight out from their top, and just before it registered, Keegan’s stick pierced the earth only inches away from Mr. Hayes’s feet. Before he could reach for it, though, a dark, shadowy figure launched itself from the bushes, directly at him. Before he could even attempt to dodge whatever was coming for him, Mr. Hayes felt the weight of the creature pounce against his chest and he fell back and tumbled to the ground. But before his body had settled against the earth, the creature’s weight rebounded, knocking the wind from his lungs, and rocketed back into the air. Dennis was next to fall, but this time, when the weight touched against his shoulders, he managed to grab it and pull the creature down with him. The two rolled on the ground, the crackle of crumbling foliage caused the air to fill with dead leaves, until, by chance, they crashed into the trunk of a tree. The boy’s head darted from side to side, from one Devil’s Creature to the next, and backed against the tree as best that he could. When he noticed the larger creature starting to advance toward him, he hissed and growled like a large cat, causing the creature to back away. The boy looked slightly confused, but Mr. Hayes could tell that he understood. His main concern was how frightened he was and the fact that Keegan couldn’t stop bouncing around. “But…” Keegan stopped the jitter-wiggles and slouched his shoulders. “You can be the first to tell your mom who we found,” Mr. Hayes attempted to sweeten the deal, which worked instantly and Keegan’s beaming grin returned as he sprinted back toward the house. The boy was staring curiously up at Dennis and Mr. Hayes as the two took turns speaking. Dennis couldn’t tell if he was scared or disappointed. A part of him wanted to keep the boy, but he could tell that he was dangerous and the thought of bringing him back to the house, which he knew was about to happen, freaked him out even more. Mr. Hayes crouched down and looked into the boy’s eyes. He had half-expected to see rage, like a scared animal, but they couldn’t be more human, filled with innocence, curiosity and uncertainty. Extending his arm and reaching toward the boy, Mr. Hayes smiled at him and nodded toward his hand. The boy looked at the hand and then back to Dennis, who was also smiling at him, and cautiously approached it. When he neared, he gave the hand a few sniffs, looked over at Dennis again, and then moved and scurried back toward the tree. It was then that Dennis lowered himself onto his hands and knees and crawled toward the boy. Mr. Hayes shook his head and nodded violently for his son to back up, but Dennis ignored him. He smiled at the boy, keeping as low to the ground as he could, and slowly moved closer. As Dennis neared, the boy became anxious and clawed at the tree trunk, as if attempting to climb away, but the closer he got, the more curious the boy seemed to become. By the time Dennis was only inches away, the boy seemed to have accepted his presence and sat down in a crouch, pressed tightly against the trunk as he sniffed the air. Out of the nowhere, the boy’s hands grabbed either side of Dennis’s head and his fingers started circling through his hair between sniffs. And that’s when it happened: he laughed, very faint at first, followed by an excited medley of squeals and snorts. Dennis held his breath and raised his hands to the boy’s wrists, being extra cautious so that he didn’t scare him, and slowly removed the boy’s hands from his head. The boy looked both confused and disappointed and immediately stopped laughing, as Dennis tried to reassure him with a smile, suppressing his nerves as best he could. “It’s okay,” he said and slid his right hand down the boy’s wrist and over his palm until he wrapped his fingers around the boy’s rough and callused hand. To Dennis’s surprise, the boy accepted what he had done and even started to follow when Dennis began to step away from the tree. It had seemed like an eternity to Dennis. Guiding the boy from the woods was, by far, the hardest, most-scariest thing he had ever done. But for some reason, all he could think of was how he’d definitely be entitled to a raise in his allowance after this was done, and the thought made him smile. The boy seemed to notice this and reached out and poked Dennis’s cheek, causing Dennis to gasp in apprehension, which the boy seemed to find funny and poked him again. “Ouch!” Dennis said nervously and rubbed at his face, but the boy just chuckled at this even more. Dennis could finally see the house as they approached the backyard and was finally able to swallow the ball of nerves that had been growing in his throat. However, the moment he crossed the treeline, the boy stopped and snatched his hand away from Dennis. “What’s the matter?” asked Dennis, even though he knew the boy couldn’t reply. 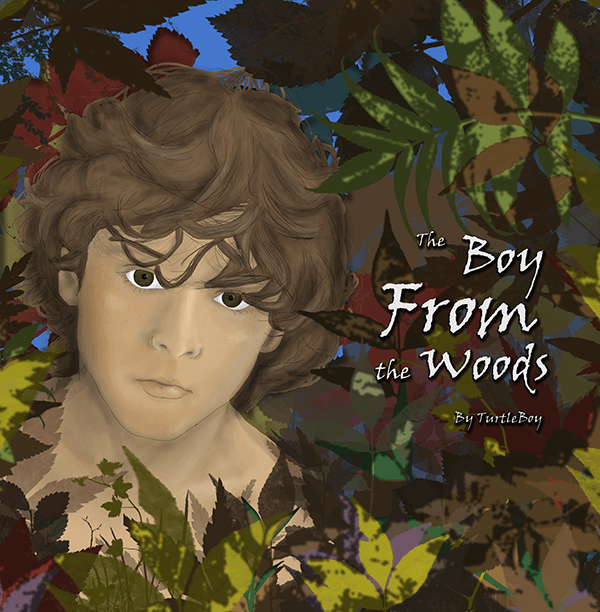 The boy stared up at the house as he stepped back into the shelter of the trees. “So they’ll just force him out of the woods and take him away?” realized Dennis, suddenly feeling bad for the boy. Just then, back over by the house, Dennis saw the headlights of a cruiser pulling into the driveway, which gave him a heavy feeling in his gut. Dennis looked back at the boy in the woods, clinging on to the trunk of a young tree, and then up at his dad. Dennis wasn’t sure what came over him, and before he even knew what he was doing, he had thrown his hands up over his head and started yelling at the boy, screaming at him to go away. Mr. Hayes, who had just begun walking across the yard to speak with the policemen, whipped back around and darted for his son. The boy in the woods hadn’t moved, however, and just stared at the two and giggled—until he saw the light beam across the grass, coming right from a tall and shadowy creature that was moving right toward him, which is when he realized what was happening. Dennis could see the anger of betrayal on the boy’s face. The trust he had earned was gone and, just as quickly, so was the boy. The police had formed a search party and were still searching the woods for the boy. It had already been four hours, and Mr. Hayes hadn’t even thought to turn on the game. Now it was dinnertime. The table was covered from end to end with a Thanksgiving feast, but not one of the Hayes Family members was able to enjoy it. Keegan was stirring his fork in a mini-mountain of mashed potatoes and gravy, while Dennis stared at the back door, half-expecting to see the boy from the woods standing on the deck waiting to be invited in. Mr. and Mrs. Hayes were eating quietly, both taking turns staring at the phone to see if it was ringing, but somehow turned itself to silent. “Because that’s what you’re supposed to do,” answered Dennis’s mom.